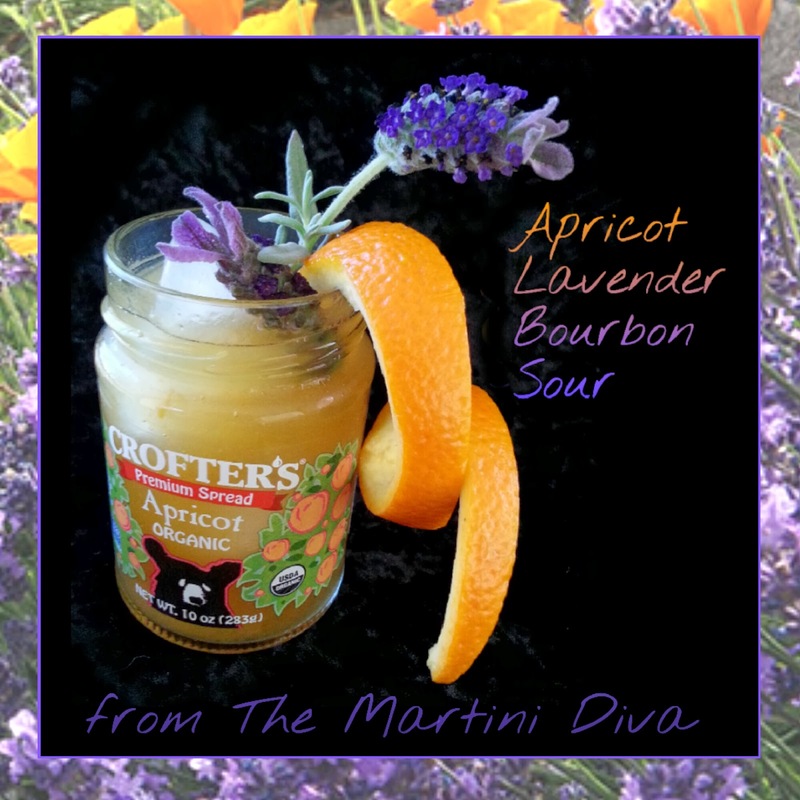 I happen to be having a tiny little love affair with bourbon right now and I had a sweet little jar of apricot preserves from Crofter's Organic so I thought to do an apricot version of my Blackberry Jam Bourbon Sour. I do love whiskeys and bourbons in cold weather, they just warm you up from top to bottom as they slide down. Add some acid and some sweetness and mix in a fresh herb and you have a lovely winter cocktail. The apricot jam and lavender syrup bring the sweet element, the lavender syrup and garnish bring a subtle floral essence, the orange brings the citrus (the sour portion), the orange twist adds a nice little dash of bitterness and the bourbon brings the happy! Warm the apricot jam with the orange juice in the microwave for about 15 to 30 seconds - long enough to thin the jam only. Fill a chilled cocktail glass with ice, pour in your whiskey, the lavender syrup, and the lemon juice/apricot jam mixture. Stir until chilled, twist the orange over the top, drop in then garnish with the lavender spring and serve. If you prefer you can add all the ingredients except the garnishes to an ice filled cocktail shaker and shake up your cocktail then pour into your glass. Bring 2 cups of sugar and 1-1.2 cups water to a boil in a saucepan over medium heat. Stir as the sugar dissolves. Remove from burner and add 5 large springs of lavender. Cover and let the lavender steep until the syrup has cooled. Strain mixture through a fine mesh strainer into a clean squirt bottle with a cap. This should keep if refrigerated for a month or longer.